LANDOLT WINE Landolt Co., Ltd. was founded by Mr. Hannes Landolt, a wine connoisseur, who was born in Switzerland, where his parents have been running the wine business for 170 years. However, we distribute wines imported from Eastern Europe only, such as Romania and Moldova, because of their good quality and great value for money. Currently, we have almost 30 different kinds of fine wines from Romania and a variety of sparkling wines (white-, red-, and rosé sparkling wines with traditional Champagne Method) from Moldova. Romania, one of the oldest wine-making countries in the world, has been producing wines for more than 2,500 years. Still unknown to many people, Romanian wines are now increasingly accepted because of their excellent taste and reasonable prices. Moldova was formerly the Moldavian Soviet Socialist Republic (SSR) of the Union of Soviet Socialist Republics (USSR). Produced in the longest (65 km long) wine cellars of the world, “CRICOVA” is one of a few sparkling wines in the world that still use the classic “Champagne method” to ensure the top quality. The unique collection of Moldova “CRICOVA” sparkling wines is 100% made from grapes grown on the famous Cricova peninsula in Moldova since over 50 years. 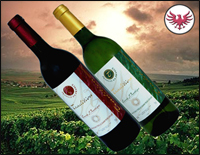 Landolt wine is also distributing wines from France, Italy, Argentina, Chile and possibly in short time from many more countries. All these countries are well-known Wine producing countries to most of you. They don't need a special introduction on this page.